I am looking for Inauguration tickets for my parents, who are longtime civil rights activists in Florida named John Due and Dr. Patricia Stephens Due. Beyond my campaign calls and carefully-budgeted contributions, I am a political outsider…so I am making a simple appeal. My parent celebrated their 46th wedding anniversary on Jan. 5, and the first lesson they passed to their three daughters was the most profound lesson there is: Individuals can change the world for the better. My parents were foot-soldiers in the civil rights struggle. Like thousands of other activists of all races, they never got a holiday or a stamp—but without their sacrifices in the 1960s and beyond, we would not be inaugurating Barack Obama on Jan. 20. But change always comes with a price. To this day, my mother wears dark glasses even indoors because her eyes were injured by a teargas bomb thrown in her face by a police officer during a nonviolent march in Tallahassee in 1960. She was also shot at while trying to register Florida voters in 1963 and 1964. My father, who once represented Dr. King after an arrest in St. Augustine, got a call from the FBI warning him that he might be the target of a racist’s bomb—and that was in the late-1980s. U.S. bombings were in the news; home-grown, just like in Birmingham. I remember that call well. So, yes—I want my parents to see the official ceremony up close; far more than I want to actually witness the Inauguration myself…although I surely do. My parents wouldn’t only be attending for themselves: They would be there on behalf of the countless other activists who did not, or could not, make it to witness this day. 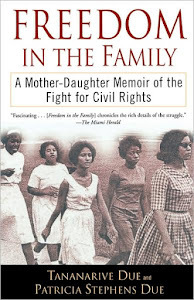 In 2003, my mother and I published a memoir we co-authored: Freedom in the Family: A Mother-Daughter Memoir of the Fight for Civil Rights. Researching that book about ordinary people doing extraordinary things, I learned first-hand how many of the 1960s activists did not make it to 2009 in body, mind or spirit. The war against them took a toll that is still vibrating through the next generations, and time is stealing them away day by day. But some of them, like my parents, made it to Election Night. And Inauguration Day. My mother talks about bringing back soil from Washington, D.C., to mix with the red clay of her birthplace in Gadsden County, Florida. Then she wants to plant a tree in honor of all of the foot-soldiers whose shoulders President-elect Obama is standing on. Neither of my parents expected to get caught up in a political movement when they went to college. But in 1960, as a junior, my mother was arrested at a sit-in at a segregated Woolworth lunch counter in Tallahassee. When she refused to pay her fine, my mother, aunt and three other Florida A&M students spent 49 days in jail, becoming the nation’s first Jail-In. They received a telegram of support from Dr. Martin Luther King Jr., and baseball great Jackie Robinson published a letter my mother wrote from jail in his New York Post column. My father, then in college in Indiana, read about my mother in Jet magazine and applied to Florida A&M’s law school so he, too, could join the movement sweeping the South. Most children think their parents are special, but my sisters and I had constant confirmation. We saw their names cited in books. The phone rang constantly; people and organizations in need of guidance or support. One day, my mother put in a call to the governor’s office, and then-Gov. Bob Graham called back within an hour. Although I attended public schools, my parents practically home-schooled me and my sisters with children’s books about Martin Luther King Jr., Cesar Chavez, black cowboys and other oft-overlooked figures in American history. Mom, in particular, didn’t just haul it out in February: We heard about our history all year long. While my parents often reminded us that Martin Luther King Jr. was just a man like anyone else, we always took the day off from school for his birthday, long before there was a national holiday. We drove to Miami’s Torch of Friendship and stood in a circle to say what Dr. King had meant to us. Then we would have pancakes and go home, where often my parents opened up the house to guests—activists and politicians and students—and played speeches and watched footage. Dr. King’s vibrato delivery always brought tears to my eyes. Knowing that history—and the pride and perspective it gave me—meant the world to me. That’s why history is so firmly fixed in nearly everything I write. History has great power. When Roots swept the nation in 1976 and I wanted to learn my family tree, my father told me story about freed slaves who built their own community in Indiana called Lyles Station—and fought off an attack by jealous whites. He even drew me pictures of a rousing battle in a round-house barn, with women handing their men rifles as the men stood firing from the rafters. I had never heard a story like that in any of my history books. When I left the anti-apartheid takeover of the administration building at Northwestern University in the late-1980s to go out to dinner with a departing friend—rather than face arrest like my more courageous mates—I was embarrassed to tell my mother that I’d sold out. I went to jail so you wouldn’t have to. Those are powerful words for a child to hear from her mother. Instead of celebrating Thanksgiving or Christmas as a family last year, my sisters and I brought our families, including five grandchildren, to visit my parents in Quincy, Florida so we could all watch the election returns together. It was a night I’ll never forget. But I can only imagine what it meant to my parents. And because of their sacrifices as students, I was permitted the luxury of an extended childhood throughout my college years. I had time to develop my craft by day and fill my nights with laughter. My parents are in fairly good health, but they are 69 and 74. The trip to Washington, D.C. won’t be easy on them. But they want to go. And since they’re going…I wish they had Inauguration tickets. All I can offer is gratitude, but if you know of available tickets, please contact me at TheLivingBlood@gmail.com. Wow, what a wonderful and inspiring story! I don't have tickets, but if I did, they would be yours. Thank you, so much, for sharing. P.S. Congrats on the NAACP Image Award Nominations. You deserve it! Great story, BTW. Very inspiring. Thanks for sharing.